Responding to a water loss in a residential basement, ServiceMaster NCR was asked to prepare a bid along with a competing firm. Our client had severe limitations on his homeowner’s policy and was facing a large out-of-pocket expense. The competing firm suggested cutting out the impacted drywall, which would have cost $8,000-$10,000 to replace. 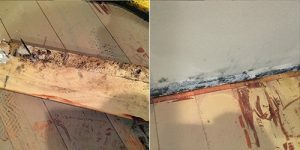 Using proven techniques, ServiceMaster NCR injected a proprietary disinfectant solution into the wall cavities to destroy mold, bacteria, and other health risks. Drying equipment was then set to remove the excess moisture from the flood, and air samples were taken to verify that no hidden mold issues existed. Holes in drywall allow disinfectant solution to reach hidden areas. The project was completely dry within three days, saving our client thousands of dollars and weeks of time. 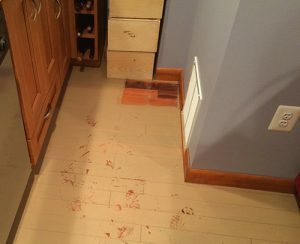 The only thing to be replaced now is the base trim – the walls don’t even need painted! 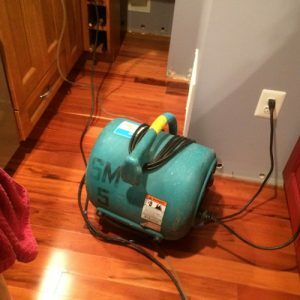 If you need help with the aftermath of a flooded basement, call ServiceMaster NCR at (703) 212-7000 – we are available 24/7/365!